The experimental protocol presented here was run in May and June 2002 at the Montreal Neurological Institute, one of the four member institutions of the International Consortium for Brain Mapping. The other members are the University of California at Los Angeles, the University of Texas at San Antonio, and Juelich/Heinrich Heine University in Germany. This consortium was formed in 1993. Its primary goal is to develop a probabilistic atlas of the human brain (by definition, any brain atlas can only be probabilistic, because of the great morphological and functional variations among different individuals’ brains). This atlas will cover both the brain’s structural anatomy (the probability that a given structure will occur at a given site in the brain) and its functional anatomy (the probability that neuronal activity will increase at a given site in the brain while the individual is performing a given task). 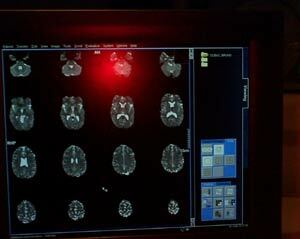 The protocol that will now be described deals with the brain’s functional anatomy. Fifty healthy subjects aged 20 to 40 participated in this protocol in Montreal. The same number of subjects were tested using the same protocol at the three other universities in the consortium, so that the results could be pooled. 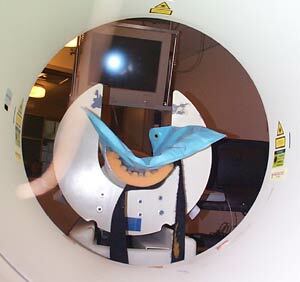 At all of the universities, each subject performed a battery of five common reference tasks while undergoing a functional magnetic resonance imaging (fMRI) brain scan, then repeated the battery while undergoing a positron emission tomography (PET) brain scan. 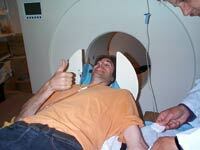 This first set of photos shows a few steps in the part of the protocol where fMRI was used. 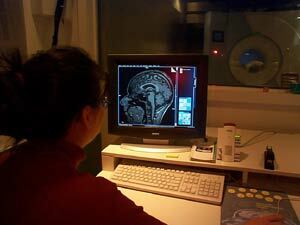 The subject receives instructions and is placed in the fMRI scanner. 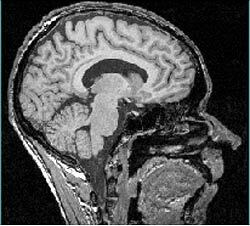 After a few minutes, the computer produces structural MRI images of sagittal sections (left) and axial sections (right) of the subject’s brain. A sagittal section showing the inside of the subject’s left cerebral hemisphere. 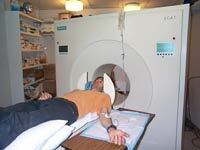 Now here are some photos showing a few steps in the part of the protocol where PET was used. 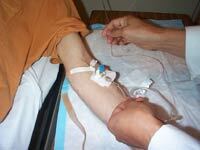 A catheter is inserted in the subject’s arm and is used to inject a radioactive solution at regular intervals during the scan. 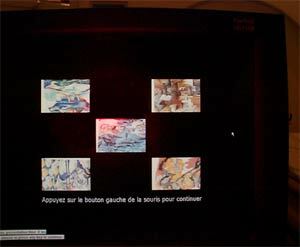 Rear view of the scanner, with the monitor that displays the images associated with each task that the subject performs. The images here are abstract designs used in the task that exercises the subject’s working memory. The aqueous radioactive solution used in this protocol has a short half-life (2 minutes). It is produced in this room adjacent to the PET scan room, then taken into that room, where its radioactivity level is checked before it is injected into the subject. the subjects had to silently generate verbs that corresponded to objects whose images they were shown. 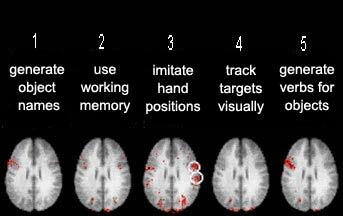 Each of these tasks also included a control task that enabled the computer to determine which areas of the brain were the most active during each specific task. The following picture summarizes the results obtained for these five tasks. 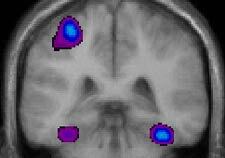 The two white circles in the centre image indicate sites of potential interest for transcranial magnetic stimulation (TMS) combined with a PET scan. Source: International Consortium for Brain Mapping and Dr. Roger Woods, UCLA. This next picture compares the results for five different subjects for two of the five tasks: imitating a hand position and generating a verb. Note the great variation from one subject to the next. Lastly, here are a few images of the brain of the subject shown in the preceding pictures, while he performed some of the five tasks. 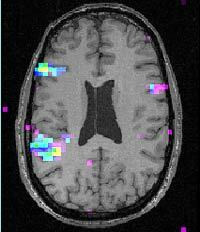 Axial section scanned by fMRI while the subject generated the names of objects after hearing descriptions of them. The primary activity is in the left hemisphere, in the areas associated with understanding and generating language. 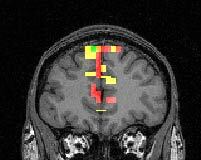 Coronal section scanned by fMRI while the subject used working memory to track abstract designs, The primary activity is in the prefrontal cortex. Sagittal section scanned by PET while the subject imitated positions with his right hand. The primary activity occurs in the visual cortex, and the secondary activity in the cerebellum, which is responsible for motor co-ordination. Coronal section scanned by PET while the subject imitated positions with his right hand. The primary activity occurs in the motor cortex of the left hemisphere and the secondary activity in the two ventral visual cortexes.